Now updated and revised with new content! I have two kids starting 2nd and 3rd grade this year. Unfortunately, we haven’t yet done much writing and I wanted to see what levels you would recommend I start them on. Thank you! i downloaded the phd version of this book. Why is the page number on each page so odd? very curious…. In the book. So be advised that if you order the complete book you won’t get all the passages. The program itself is wonderful my 7 year old son loves it. I have the complete writer instructor text copy right 2015. Is this your lastest version? If so can I just purchase the loose worksheet instead of the student workbook? 5 out of 5 We LOVE Writing With Ease! I’ve been homeschooling for 11 years and have 6 kids. We’re on our 3rd round of Writing With Ease with our 3 youngest. It is so helpful in prepping kids for writing, taking notes, comprehension, finding the main idea in a story etc. Great job! May I know what is the difference (in terms of content) between “Instructor Text” and “Workbook”? If I purchase the “Workbook”, do I still need to purchase “Student Pages” for my kid to write on? Thank You! The Instructor Text is an overall book for the instructor that covers all four “Levels” (years) of the program. 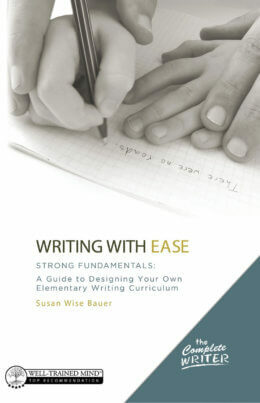 It also gives helpful advice, answers frequently asks questions, and explains our approach to teaching writing. The Workbook is the actual course for the year. In the back of the workbook are perforated “Student Pages” that can be torn out when it is time for the student to do each exercise. The product we sell that is called “Student Pages” is an EXTRA set of the student pages…it’s useful if you’re teaching the program to more than one student. But if you’re only teaching one student, you probably don’t need the Student Pages. We started homeschooling and my kids are grade 5 and 6. Do we start with WWE? Would WWE be instead of a writing program like IEW? Hello! I have a copy of WWE: Strong Fundamentals…years 1-4 as well as the Complete Writer level 4 workbook student pages. I realize that the teachers manual is condensed due to it being an instruction book for all 4 levels. My question is this: am I understanding correctly that for the “Original Sentence Exercise” is where I as the teacher am to write out the summary narration that my student dictates to me? It seems odd because, if I’m doing the writing, I cannot then see if he’s using proper grammar (punctuation, capitalization etc). For younger students (grades 1 and 2 especially), doing two things at once (creating the narration in their minds, and writing it out with proper grammar/spelling/punctuation etc) can be too difficult. By grade 4, if the actual mechanics of writing sentences have been mastered, the student can write the summary narration out herself. Does the Student workbook have the answers in .. or is that in the Instructor Text? The front half of each Student Workbook contains the answers for the instructor.